These are the rules and guidelines of acceptable behavior for this website. We maintain the right to exclude users from the site who abuse it. Intellectual Property. The contents, logo, videos, drawings, pictures, and product descriptions are all property of Armydogtags.com except where noted. Armydogtags.com exclusively retains ownership of all rights, title and interest in and to the website and you are not entitled to copy, scrape, (hyper-/deep) link to, publish, promote, market, integrate, utilize, combine or otherwise use the content or our brand without our express written permission. Any unlawful use of or any of the aforementioned actions or behavior will constitute a material infringement of our intellectual property rights (including copyright and database right). This includes using any of our pictures on your own website to sell products. It is strictly forbidden to use our pictures for commercial use. Termination. Users can be terminated from the use of this site if it is found they are abusing the website. Termination can include all or some of the following actions: removal of a customer user account and any associated accounts from the website, removal of a customer from office computers, disallowing telephone, e-mail, and US Mail communication. Governing Law. Armydogtags.com is committed to customer satisfaction. We will try to resolve any concerns or problems with our services that you have. “Armydogtags.com” is a company formed under the laws of Fullerton, California in the United States of America. Laws of Fullerton California will be used. The extent of refund will only extend to the original purchase price for goods. Links to Other Web Sites. We are not responsible for any third party websites that we are linked to. Scope of Our Service. Through Armydogtags.com we provide an on-line platform through which buyers can purchase military type dog tags. We are not affiliated with the US Government nor are we a government agency of any type. 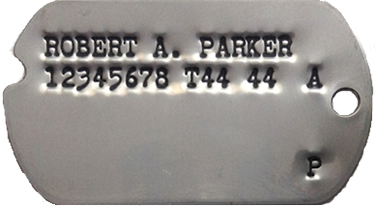 We can not access military records and only stamp on the dog tags information that is provided by the customer. The responsibility for accuracy of the information lies with the purchaser. When a customer buys from Armydogtags.com they are buying directly from us. We do not use the services of any third party except in the delivery of goods through the USPS, FedEx, and UPS. Our products are for personal and commercial use. 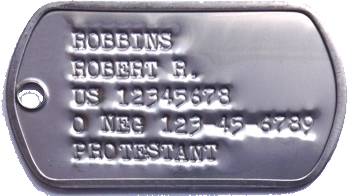 There is no single, absolute way that any dog tag from any time period was made. We do not guarantee that the information presented will fit your exact requirements. 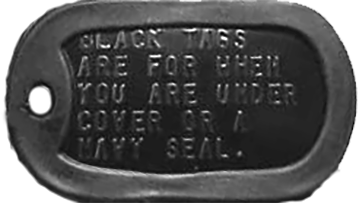 The formats and notes are all based on general rules of dog tag production throughout the years by the US Government. Armydogtags.com only speaks for itself through their observance of dog tags and does not speak on behalf on any governing board or the US Government. 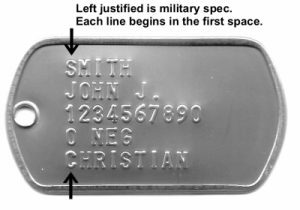 We follow US Government guidelines and examples in our production of dog tags but do not set policy for the US Government concerning dog tag production. 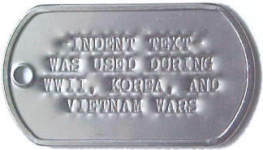 Armydogtags.com in good faith will produce dog tags that are acceptable facsimiles of dog tags without guaranteeing exact text, content, or positioning. Nor do we guarantee that the materials used are of the exact composition, thickness, and/or shape for any given time period. 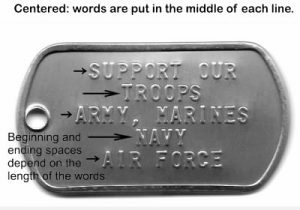 The materials that are used are materials that are made today and in no way do we represent that they are dog tags that were made in any other time period than today. What Users Can Do. Users of the website can use and reference the material we have presented to aid them in filling out the website form to purchase military dog tags. 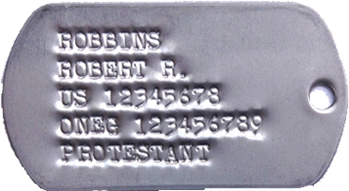 The information, notes, and formats we have provided are guidelines of actual dog tags we have seen. What Users Can Not Do. Users can not use any picture, format, or notes in the activity of gainful and/or non-profit enterprises. All pictures and presentations are the express property and original creation of Armydogtags.com. Users can not abuse the web site and its contents in anyway. Defacing the website, claiming ownership, claiming creation are all reserved to the owners and workers of Armydogtags.com with full rights reserved. Users may not harass workers in anyway. Such behavior will result in the termination of their user account and will be banned from use of the website and telephone service. Armydogtags.com reserves the right to refuse service to customers for any reason. As a condition of use, you promise not to use the Services for any purpose that is unlawful or prohibited by these Terms and Conditions. Ownership rights to Armydogtags.com. 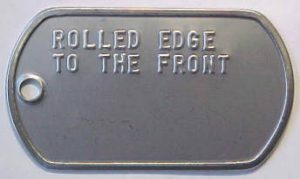 Armydogtags.com is a stand alone website. We do not sell on Ebay, Amazon, Facebook nor are we related to any such site in anyway. We do not employ third-party sellers nor are we a third party seller or affiliate. Acceptable payment terms. Payment is made in US Dollars by way of credit card (Visa, MasterCard, Discover, and American Express) through the internet or by phone (phone hours vary). Payment by personal check and money order can be mailed to us. Wire transfers and C.O.D.s are not accepted. Shipping. For common transactions over the internet we use the following shipping agents: United States Postal Service, domestic and Air Mail and FedEx (also referred to as Federal Express). All are considered secure means of delivery. We are not responsible for any error they cause in the delivery of items, for example but not all inclusive: mis-deliveries, untimely deliveries, deliveries not made due to severe weather and/or disaster, theft from agent, etc. 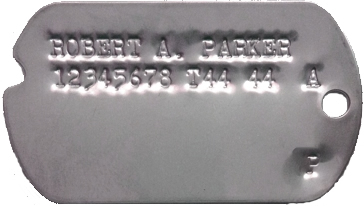 If items are damaged in transit, Armydogtags.com will provide new merchandise but will not be held liable for damages caused as an unforeseen result of inadequate delivery. 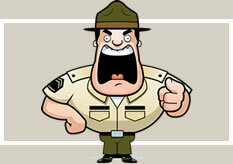 For orders that are larger, UPS (United Parcel Service) can be used and the same rules apply. Orders for Overnight Delivery will be given highest priority and in good faith. 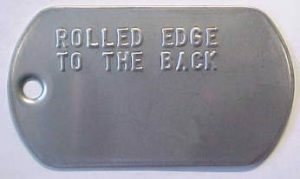 However, Armydogtags.com will not be held responsible if carrier is unable to make delivery within the given time frame. Overnight Delivery does not include Saturday, Sunday, or holidays. Overnight delivery times are usually suspended from December 19 – January 2 of each year. 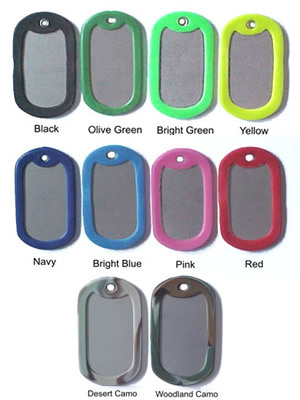 Dog Tags are usually stamped within 24 hours except on weekends and holidays. Holidays include the entire month of December. 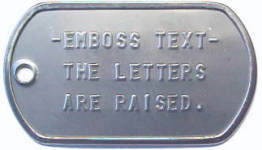 The actual time to stamp your dog tags may vary especially if there are grammatical errors and/or formatting questions regarding the text for the dog tags. 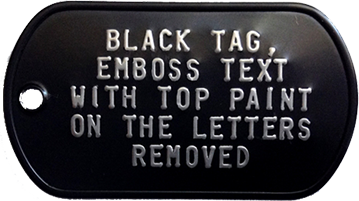 In good faith, Armydogtags.com will stamp all dog tag orders in the order of receipt and within a reasonable period of time for accurate manufacture. Return/Refund policy. All claims for refunds or returns must be made within 30 days of purchase. If the item contains personal stamping (meaning contains information that is only applicable to that person, name, birthdate, etc.) 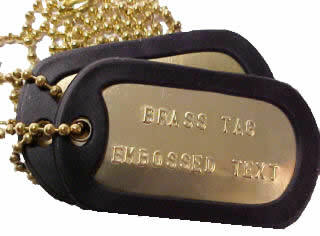 Armydogtags.com is not required to accept returns or exchanges unless the product is damaged or defective upon arrival. Limitation of Liability. We are not responsible for the product and how it is used once the customer takes possession of it. Dog tags must be worn in a safe and reasonable way. Taxes. We are a website engaged in the legal selling of goods. All sales made on our website are subject to tax of the United States of America, tax of the State of California, and Sales Tax laws of California, the State Board of Equalization. All taxes are collected, calculated, and paid. Data Protection: The highest forms of data protection are used. The information we collect is only used to fulfill your order. 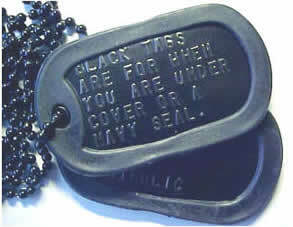 Names, address, phone numbers, e-mail addresses, and personal information that is put on the dog tags is never sold nor used by third party marketing agents or agencies. Credit card information is never stored on our web server. Credit card authorization through our website results in “Accepted” or “Declined” without any transfer of credit card information.